Learn more about some of the key issues in Beyond the Badge, and discover how law enforcement, schools, and communities can work together. Thank you for your interest in hosting a screening. Delivery of the DVD can take up to 4 to 6 weeks, but it's never too early to start planning your screening. 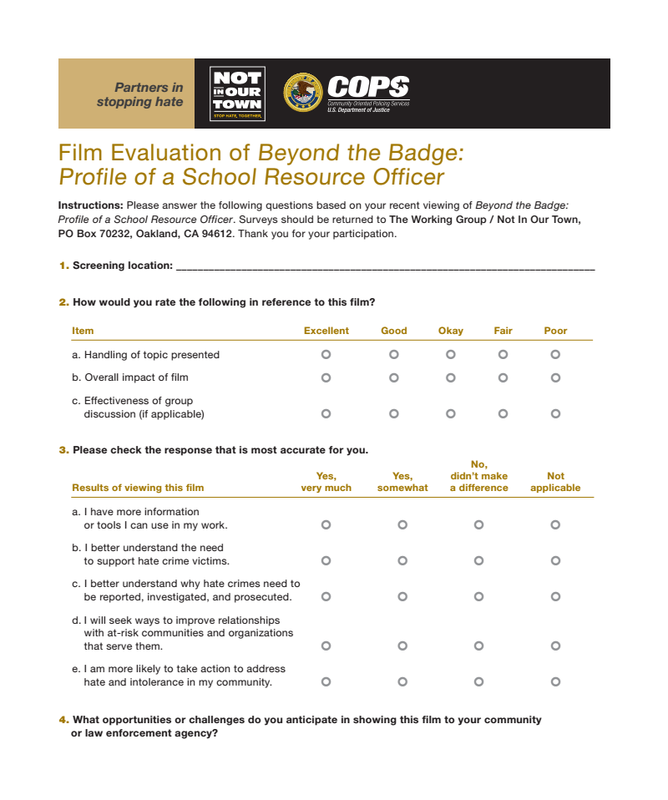 We’ve created the Beyond the Badge Screening Kit to give educators, law enforcement, community groups, and faith leaders resources for showing the film and opening the conversation about how students, law enforcement, and school leaders can work together to build trust. To download a PDF of the Preventing and Addressing Bullying and Intolerance guide, click here, and to order a print copy from the COPS office, please click here. More information on the contents of this guide and how it can be used as a resource for schools can be found here and here.